HubSpot Sales, despite being relatively new, has become one of the most successful and popular sales tools available today. G2 Crowd, which provides crowd-sourced and unbiased user reviews and ratings for software, has named HubSpot Sales, first released in 2014, as a Leader within the Email Tracking tools category. 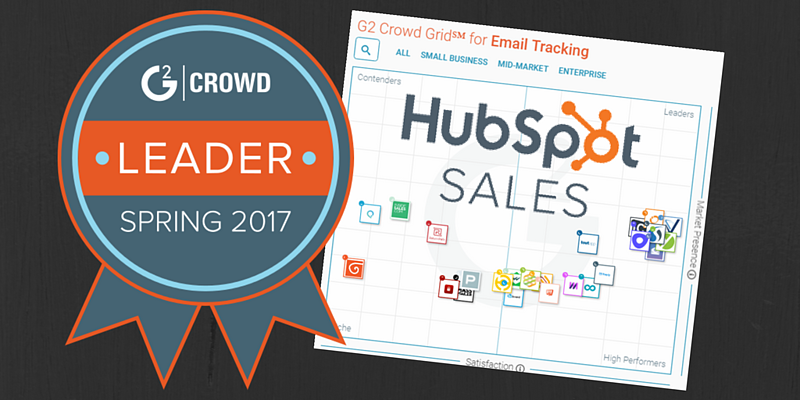 Aside from being named a Leader in the G2 Crowd Grid℠ for Email Tracking, HubSpot Sales also ranked 2nd among all 52 email tracking tools listed in G2 Crowd by their G2 Crowd Score. The G2 Crowd score is calculated based on the software's combined market presence and customer satisfaction ratings. HubSpot Sales' high rating is indicative of the platform's wide popularity and satisfaction. In fact, HubSpot Sales garnered one of the highest number of ratings, reaching up to more than 400 independent user reviews. Products in the Leader quadrant are rated highly by G2 Crowd users and have substantial Market Presence scores. Aside from HubSpot Sales, other Leaders include: Velocify, Cirrus Insight, ClearSlide, Yesware, SalesLoft, and Outreach. Other categories in the quadrant include High Performers, Contenders and Niche. High Performers, or those that achieved high ratings from their independently-sourced user reviews but don't have the same market share or scale of the Leaders. Contenders, on the other hand, do have significant market presence and resources but have below average user satisfaction ratings or they have not yet garnered enough ratings to validate them. Finally, those named as Niche solutions do not have the same market presence nor have received enough user reviews but have been rated positively by the few ratings that they have. Organizations frequently use email tracking software within their sales and marketing departments to identify optimal engagement points and improve communications with prospective customers. Email tracking products and the analytics they provide are used to evaluate and improve sales and marketing messaging to maximize the potential for prospect engagement. Email tracking software integrates directly with email platforms and is often implemented as an addition to complementary sales and marketing products, such as CRM and email marketing products, to form a complete sales force automation system. HubSpot Sales is one of the platforms that the Extra Group offers as part of its Sales and Marketing solutions portfolio. But more than offering HubSpot Sales and the rest of the HubSpot Growth Stack such as HubSpot Marketing and CRM, Extra Group's marketing and sales solutions subsidiary Extra Magnet also offers advanced marketing automation and HubSpot integrations. Creating advanced marketing automation workflows and developing complex HubSpot integrations with other 3rd party applications and processes, HubSpot users can get more out of their platforms.